As a writer, I hate going out of the office to meet clients. To me, that is the job of the servicing department. Before you write me off as an introvert, note that I do enjoy mingling with people. But since I have to mingle and socialise at events after work, I’d rather not do so when I’m working. Sadly, my boss doesn’t seem to agree with my theory — he drags me out to see clients almost all the time. 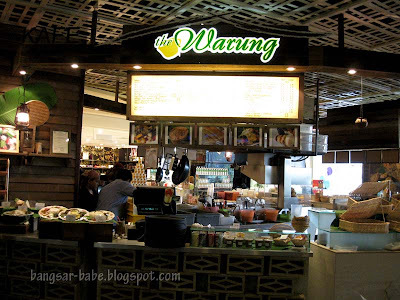 At a recent client meeting, I spotted Warung when we crossed over from Northpoint to Mid Valley. Since my boss wanted to impress the client with an overpriced yet mediocre lunch, I told myself I’d make a trip to Warung another day. That day came a week later, after the Che Che New York launch. The place really resembles a warung, except that it is cleaner and newer. Its decor boasts aluminium tables, wooden stools, wooden wall panels and old vases — a very old school set up. 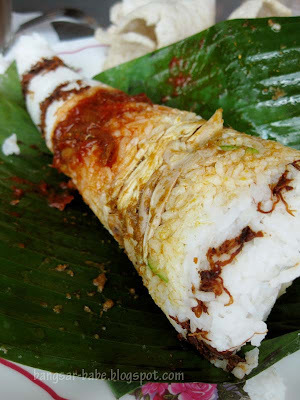 I already had my eye on the Nasi Tumpang (RM9.80), as I was curious to know what was under the tall wrap. This multi-layered creation comprised chicken curry, rice, cucumber, egg, sambal and serunding, with keropok ikan and acar at the side. It was good stuff! Soto Ayam (RM6.50) was quite popular among diners, judging from the number of bowls on my table, and on every other table. I had a few bites, and it was rather delicious. 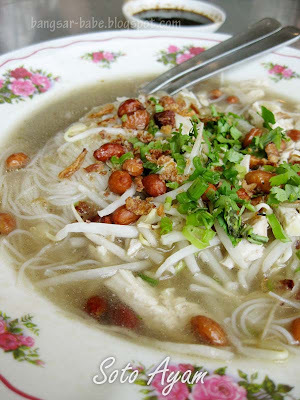 I’m not a fan of soto ayam, as I vaguely remember eating a nasty, MSG laden version when I was in primary school. But Warung’s version was full of flavour and nicely peppered for a good kick. 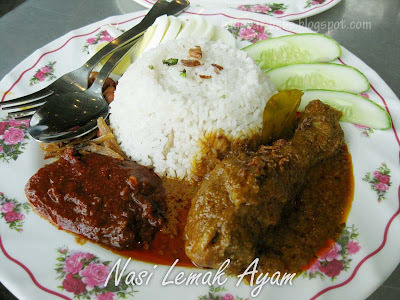 I didn’t try the nasi lemak ayam (RM6.90), but according to the person who had it, the nasi tumpang was better. I was slightly sceptical about the Burger Warung Special (RM4.80). “How good can it be?” I asked myself. While it wasn’t as good as the top 3 burgers on my burger list, it was tasty in its own way. The egg-wrapped patty came smothered with mayonnaise and chilli sauce, with a slice of melted cheese. It was hardly greasy, but had a good amount of sloppiness. I meant to share the kuihs I selected, but it was so good, I ate it all. My favourite was the pulut inti. 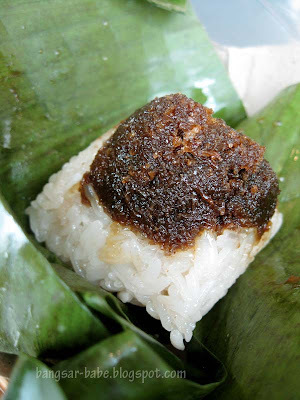 The glutinous rice was fragrant and full of caramelised grated coconut. 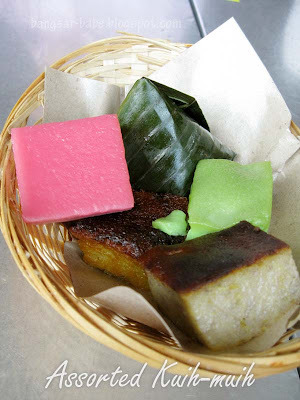 The bingka ubi (baked tapioca kuih mixed with sweet pandan-flavoured custard) was also very good. It was of just the right sweetness and the brown top was rich and beautifully caramelised. 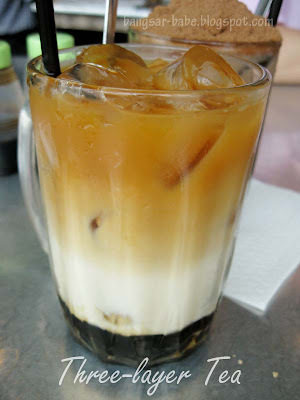 Three-layer tea (comprising gula Melaka at the bottom, evaporated milk at the centre and tea at the top) is becoming more and more popular these days. The one I tried at a Chinese coffeeshop was so-sweet-until-can-die, I never ordered it again. But I didn’t want to be rude, so I had a sip at Warung. It wasn’t as sweet as I feared it to be. The layers were well balanced — it was fragrant, creamy and rich. 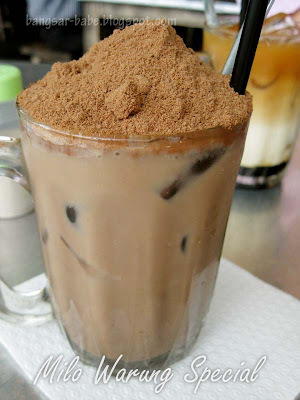 Milo Warung Special was very thick. I don’t think I’ve ever had Milo this thick before, unless I made it myself. I enjoyed my meal, especially the kuih and nasi tumpang. 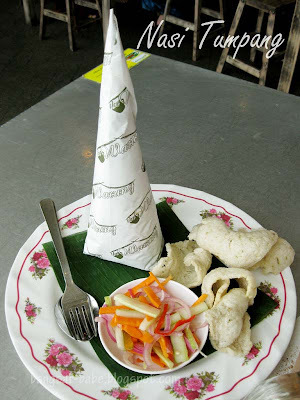 I would like to try other things on the menu, but I can’t bring myself to pass up the nasi tumpang just yet! Who wants to go with me again? Verdict: The food isn’t fantastic, but it is homely and satisfying. Warung is now bookmarked as my good-places-to-eat in Mid Valley. i still haven't managed to drag myself here yet, since it sounds like it's at the far end of mid valley! this one HALAL one…. where got nice? ME ME ME! This is considerably cheap, given the rather strategic location. I'll go with you! I work in Gardens now so I don't mind checking this out one of these days perhaps for lunch? Send me a message on FB and we'll hook up! Looks good and I think i would need to drag more people to go with me so that I can order more goodies to try. I love the kuihs!! They really do it well. J2Kfm – Email me your number, can we go eat together. It's about time we met up! 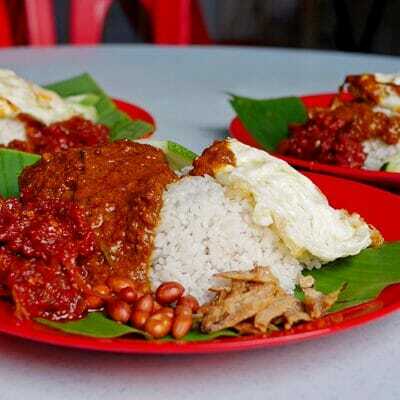 Eric – It's Kelantanese food, that's why. You were lucky no rats fell from the roof/ceiling. It was a horrible experience and disgusting.